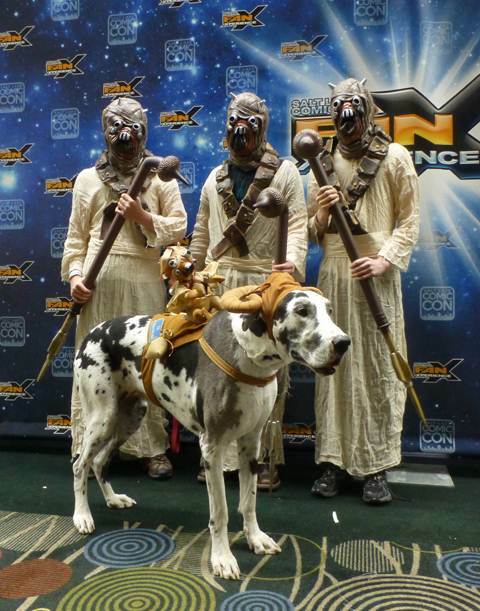 Old man Ben advises that sand people always travel single file to hide their numbers. These indigenous Tatooine residents get a little bored in between hunts so they like to muck up the plans of the non-natives who venture outside of Mos Eisley. If you fancy yourself tribal at heart, love camping, and are a crack shot with a cycler rifle, you're going to want to wear this fully licensed Tusken Raider costume. It's perfect for day trips to the desert or for raiding the stocks of moisture farmers. 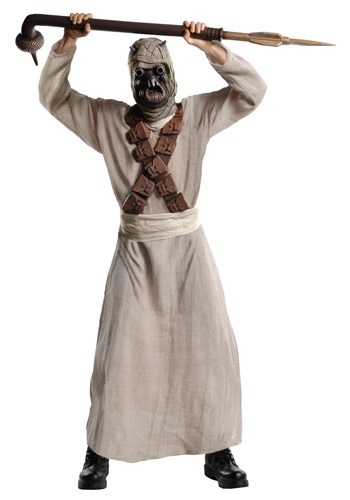 To complete the costume pick up our replica Tusken Raider Ghaderffii Staff and start practicing your Tusken yells! The mask is of good quality, looks great, and is as comfortable as any latex mask to wear -- mainly because it's open in the back. Serious Cosplay folks would probably want to spend extra to get the full head mask that comes with the evaporative capture necklace thing. The bandoliers required some modification to make them look good. They come sewed onto the costume way too lose and sag like so much cheap foam-rubber. However, by seam-ripping them off where they are sewn on the shoulders and velcro-ing ends together behind the neck they hung tighter and also looked more real from behind. The fabric was the big disappointment. It's not nearly as thick as shown in the manufacture's picture. In actuality, it is a thin cheese cloth (too thin to sew when it tears and it tears easily whether you stretch/flex wrong or sit on hard and/or coarse surface. I'd give a 5 star rating if the fabric was more durable and or the price was less expensive. It would be fine for a single night of Halloween but otherwise be ready with the safety pins. P.S. The Bantha stick IS Awesome! Durable, but light-weight and worth every penny makes sure you add it to your order. So I read the other 3 reviews here and saw 2/3 were pretty bad but I didn't feel like making one so I ordered this with the staff. It all feels and is really cheap I mean the mask and the staff look ok but the robe is like toilet paper quality and not even bounty. The bandolier don't sit right so I gotta fix those and I heard I rip when I tried it on I'm 5'8 and 160 so yeah it's not like I'm stretching anything. Really wish I hadn't been so lazy and just made my own probably would have been cheaper. For 64.99 I didn't expect perfection but this costume shouldn't be sold for more than $10. If the example picture showed how the belts sat around the waist and the models clothing underneath showing it would be more accurate. The sleeves were way too short and the neck way too open.